On April 14, 1994, on a clear morning over northern Iraq's no-fly zone, two U.S. Air Force F-15 jets encountered two U.S. Army Black Hawk helicopters on a routine mission. Within ten minutes, the F-15s misidentified the helicopters and shot them down with fire-and-forget missiles. Unfortunately, due to sales rights restrictions, we cannot offer A Chain Of Events for sale in your country. On April 14, 1994, on a clear morning over northern Iraq's no-fly zone, two U.S. Air Force F-15 jets encountered two U.S. Army Black Hawk helicopters on a routine mission. Within ten minutes, the F-15s misidentified the helicopters and shot them down with fire-and-forget missiles. For three years, aircraft had patrolled these skies with a near-perfect safety record. Although the Black Hawk's downing was one of the worst air-to-air friendly fire incidents involving U.S. aircraft in military history, the Air Force would officially conclude the pilots had made a reasonable mistake. 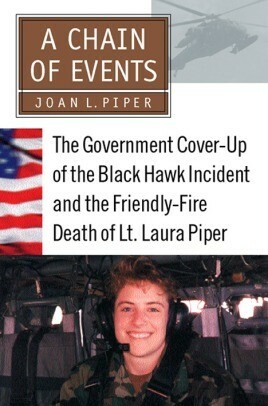 One victim was ebullient twenty-five-old intelligence officer Laura Piper, in love with life and with being an Air Force lieutenant. Movingly written by her mother, A Chain of Events is the story of Laura's final flight and the Air Force's mishandling of the subsequent investigation. It is a story of duty, patriotism, a mother's devotion to a daughter's memory, and her family's disappointment in a beloved institution.